Identify the main concepts or keywords in your topic. Then, think of synonyms for your keywords. Combine your search terms using AND, OR or NOT. Search for different word endings. 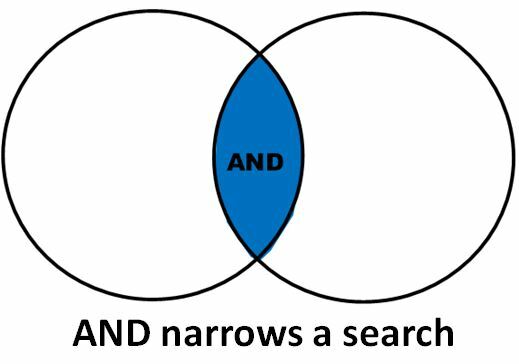 Broaden or narrow your search. Use the database's thesaurus, if available. Use analysis tools offered by the database. * An asterisk at the end of a word tells the database to find any possible ending to that word, so dens* will find dense, density, or densities. Step 3: Combine your keywords using connectors like like "AND" and "OR" when you enter your search into a database -- the keyword table can help you understand how to connect your keywords. 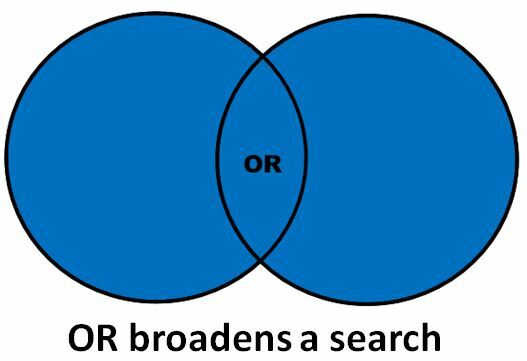 Use AND, OR, or NOT to connect concepts together to broaden or narrow your search, or to eliminate concepts you don't want searched. These three words (AND, OR, and NOT) are called Boolean operators. Make sure to capitalize AND, OR, and NOT -- this tells the database that the word is a "search operator" and not a keyword that it should be searching for. You can use quotation marks to force the database to find an exact phrase. This search will exclude articles where search terms appear individually, such as "soft pillow" or "sugary drinks." This search would miss articles where authors use the phrases "bone mineral density" or "bone densities." Experiment with your searches to see which combination(s) of your keywords get the most useful results! In many databases, an asterisk (*) tells the database to search for different word endings so that you don't have to enter and search all variations of a word. Instead of searching (simulate OR simulates OR simulation) just search simulat* --it's easier! Use database search refinements such as limiting by language, a span of years, document type, source, etc. Try searching some or all of your search terms in more restrictive fields, such as the title field. Getting zero results (or a very small number)? (costs OR ecomonics OR financing OR funding). Underwater tunnels or railway tunnels are broader terms than a specific underwater tunnel like the Channel Tunnel. *Still getting zero results? Try another database or Ask Us! We're here to help. *If you've done a thorough literature search using a variety of different search queries in all appropriate databases and you still get zero results, celebrate! You've found a gap in the literature. Remember: gaps in the literature = opportunities for research = jobs! For each new database you search, look to see how your results are being sorted. Listing the most relevant articles first (the database determines relevance by counting how many times your search term appears in each article). But remember: when you sort by relevance you run the risk of older articles rising to the top of your results list. Some databases, such as Web of Knowledge and Google Scholar, provide metrics showing the number of times an article has been cited by other articles. Looking at the articles that cite an article is a way of seeing how the research has progressed over time. In Web of Knowledge, you can sort your results by times cited- highest to lowest to see which articles have been cited the most (the most highly-cited articles might be particularly important if lots of other authors have cited them). *Citation metrics can be confusing -- if you'd like more information, remember you can always contact your subject librarian, Meg Eastwood. Some databases have a controlled list of subject terms that you can use to build your search -- this list is usually called a thesaurus. If you'd like to learn about constructing a search using a database thesaurus, please contact Meg Eastwood, the Science & Engineering Librarian. Some databases allow you to manipulate and analyze a result set in a number of ways. Please contact Meg Eastwood, the the Science & Engineering Librarian, for help with any database you'd like to learn more about! Most databases have a link to a help page that will show you what search features are supported. Show which authors have written the most papers on a topic. Show what years have the most number of papers on a topic.